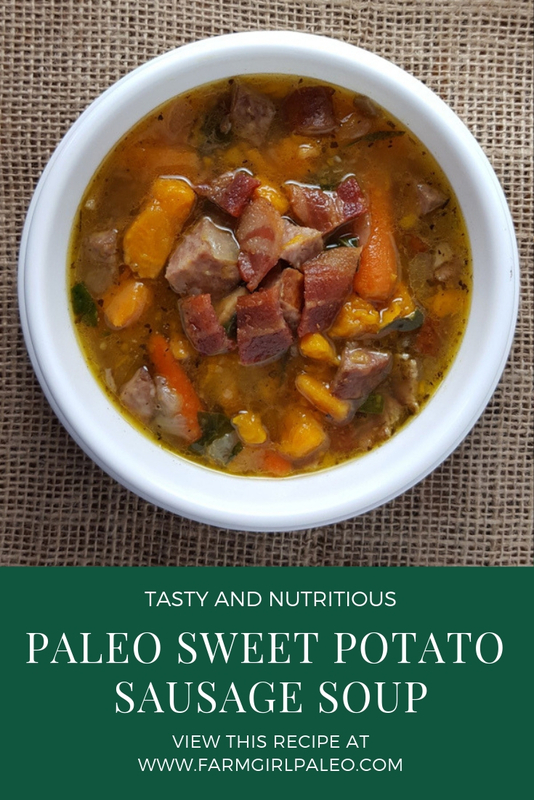 Paleo Sweet Potato Sausage Soup is a tasty addition to a chilly fall or winter day. It’s quick to cook, it has just the right amount of spice to warm you up, and it’s garnished with bacon! 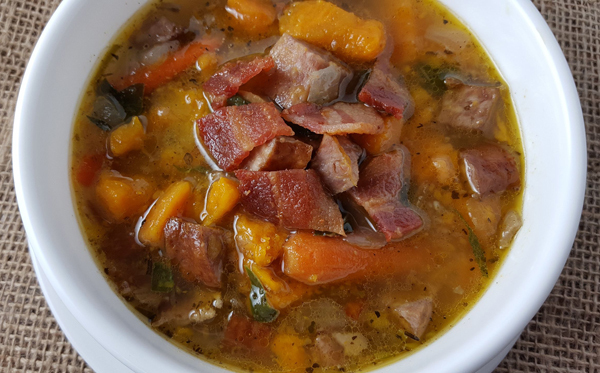 This soup is perfect cold weather food or a delicious weeknight dinner. It’s loaded with nutritious ingredients and intense flavor made all in one pan. Quick Tip: I crisp my bacon while the soup is cooking so it is still warm when serving. Heat a medium Dutch oven or large pot over medium heat, add the onion and sausage in 2 tablespoons of avocado oil or olive oil. Cook and stir until the onion is translucent and the sausage is heated through. Add minced garlic and cook and stir for 1 minute. Next, add sweet potatoes, carrots, and Italian seasoning. Cook and stir over medium heat for an additional 3-5 minutes, so the flavors will be well combined. Add the chicken broth and water and simmer for 15 to 20 minutes, until potatoes and carrots are tender. Add spinach, cayenne pepper (if you don’t like a little spice, leave this out, and salt and pepper to taste. Simmer for an additional 5 minutes. Add more cayenne, if you like. Ladle into soup bowls, garnish with crisp bacon, and enjoy! Heat a medium Dutch oven (6-8-quart) or large pot over medium heat, add the onion and sausage in 2 tablespoons of avocado oil or olive oil. Cook and stir until the onion is translucent and the sausage is heated through.